Looking for a mostly light-hearted, but touching weekend read? Then the Lemon Tree Cafe might be right up your alley. I really enjoyed The Lemon Tree Cafe. Cathy Bramley has a lovely voice and weaves a story thoughtfully and you are soon caught up in the characters lives in the small town where the story is set. Rosie is a strong-willed, stick-to-your-guns woman who quit her job after refusing to do something that she felt was unethical. Turns out Rosie is rewarded for this attitude in the end. Being strong-willed, Rosie feels that the large gardening supplies company that just purchased the former gardening center are going to put The Lemon Tree Cafe and the other retailers in her small town and that they need to strike a blow against the company by trying to undermine them as much as possible. In the end though, Rosie comes to accept that maybe not everything is as she seems to think, and that if she doesnt open both her heart and mind, she might wind up a lonely old lady like her beloved Nonna was. The real highlight of the book for me was Rosie’s grandmother – a lovely but stubborn little old Italian lady who worked in and then took ownership of the Lemon Tree Cafe for years and years after moving to England after fleeing her old life in Italy. Her favourite swear word is ‘dicky heads’ and she clearly adores both her daughter and granddaughters, even if she finds it hard to say so aloud. Nonna is also the central figure in one of the two major story arcs. 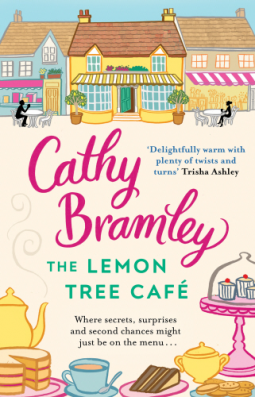 I won’t spoil too much of what happens here because it will ruin your reading experience, but I must say that the Lemon Tree Cafe was one of the books I soaked up on a rather rainy summer afternoon and evening and I am looking forward to reading more books from Cathy Bramley.